Legendary DJ and party-maker Total Freedom (Ashland Mines) – the Fade to Mind affiliate at the heart of some of L.A’s most notorious club nights – curated a crazed night of live performance in London on Friday. For his ’Burning Head Collage‘ he brought Lizzie Fitch and Ryan Trecartin’s collaborators to the Zabludowicz Collection for one night of party mayhem. 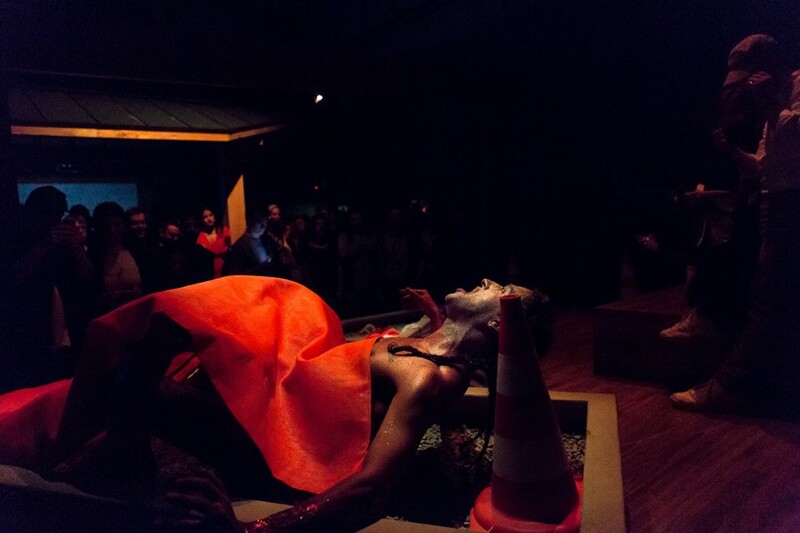 Stars of their movies Raul de Nieves and Rachel Lord performed live between DJ sets in the midst of the theatrical video installations. The party was held in stadium bleachers, vacant lots and empty pool houses since Trecartin and Fitch have transformed Zabludowicz Collection into an abandoned suburban wilderness. The gallery has become an uncanny threshold to the films – the constructed sets mirroring the residential spaces seen within them, filled with their props and detritus. Fitch and Trecartin’s dizzying, adrenaline-fuelled videos set a frenzied tone for the night. Tumbling with characters that battle for attention, they are a jumble of eccentric personalities, mashed up references, futuristic styling and digital effects. If you could plug your brain directly into cyberspace, these films are what you would see. Their hyper-charged intensity spilt out into the gallery as our eyes flicked from screen to screen. DJ Total Freedom, long-time Fitch/Trecartin collaborator, kicked off the night with an alchemy of underground eclectic beats. Creating a conceptual soundscape, he mined diverse genres and continent blending sounds from across the spectrum. His sonic collage of dark and eclectic music built up the anarchic off-beat vibe. Performer Raul de Nieves suddenly emerged from the chaos as though rising from the dead. Accompanied by a deafening improvised noise band, he appeared from the ground roaring and muttering, stuffing a microphone deep into his mouth to catch every last guttural sound. Layer by layer he stripped away his white costume, exposing his glittering naked chest and two silvery legs sewn onto his torso. Another star of the Trecartin and Fitch movies, Rachel Lord, gave a charged and disorienting performance upstairs in the balcony space. Lord, who plays Basic Jenny in the Priority Innfield series, sang ’Blood Money/ Damned for all time‘ from Andrew Lloyd Webber’s classic rock opera Jesus Christ Superstar. Playing Judus, she spun around the space, singing full volume to special guests Jesse Darling and Leslie Kulesh, playing Caiaphus and Annas. After Lord’s provocative performance, the party wound down to another set by DJ Total Freedom and his London crew. The electric night with its overdose of drama was the perfect fit for Trecartin and Fitch’s hyperactive headspace. “The evening was a wild success, with disorientation and confusion ruling the night,” said Elizabeth Neilson, Director of Zabludowicz Collection. It was an apt finale to the Frieze Week frenzy.